Docebo releases Pages, giving training managers the power to design and control the entire learner experience, with no coding required. Docebo prides itself on its passion for researching and implementing new technologies to inventively solve customers' problems, with uncompromising attention to the learning experience. This is why the company has just released Docebo Pages. Combined, this set of functionalities gives training managers the ability to design, build and manage any page or menu of their learning platform, adapting to the unique needs of diverse learner groups. “Working closely with our customers over the years, they have expressed the need for customizing dashboards and many other elements of the user experience”, said Fabio Pirovano, Docebo’s CTO. “We have analyzed their collective feedback and have come back with something entirely different and even unexpected from what customers requested. Instead of tweaking dashboards, or adding new settings, we have simply given LMS admins the power and the tools to completely design and control the entire UI and learner experience, end to end, in minutes, by composing Pages using drag and drop widgets as building blocks, with no coding skills required. Their reaction was: “Wow”. Docebo Pages offers a wide selection of widgets and templates, alongside the ability to assign a specific navigation path to each group of users. This provides limitless customization capabilities for LMS admins that translates into exceptional learning experiences for learners. “The effectiveness of a learning system lies in the ability to serve different audiences, in different use cases, through a single platform”- says Donato Mangialardo, Docebo’s Director of Product Marketing. “Sales reps, field engineers, support specialists, new hires, leaders, they all behave differently and have different needs. Think of attention span, level of details required, available time, and device preference. You can’t force them to learn the same way or use the same pages, menus, layout. If you want them to actually learn and come back for more, you need sophisticated configuration capabilities. With Pages, you can do exactly that. Design different user experiences for each group of learners, that adapt to their unique needs. The trick is to offer that capability to all LMS admins, regardless of their technical knowledge and make that doable in minutes, not hours, not weeks”. Docebo Pages is part of Docebo’s latest release, 7.4, that includes several new features around personalization and learner autonomy. For example, the ability for learners to browse the Lynda.com course catalogs and subscribe to any available course of their choice enables them to align their learning experience with their own professional growth and personal interests (e.g. a photography course), with no need for LMS admin intervention. 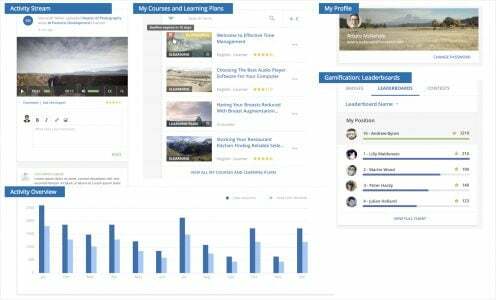 With 7.4, Docebo’s social learning module, Coach and Share, allows learners to build personal playlists by aggregating learning assets of any nature, now also including formal courses. They can be used as a topic-based list or simply as a "watch later", and can be tagged and shared with other learners. We have simply given LMS admins the power and the tools to completely design and control the entire UI and learner experience, end to end, in minutes, by composing Pages using drag and drop widgets as building blocks, with no coding skills required.